You want the toughest chalkboard surface! You will not find another Chalkboard backed by our 25-year warranty. No other company comes close to ensuring their chalkboard will provide you with years of high-quality use. 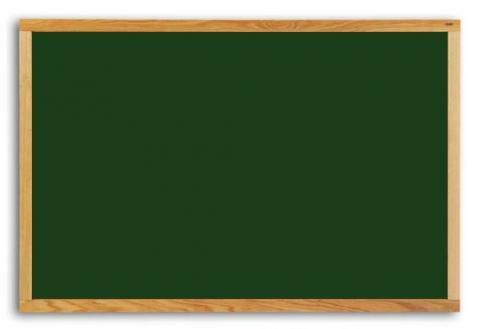 The reason we can make such a guarantee is that we construct the Vinyl Chalkboard with a High Pressure Laminate (HPL) surface, which is the most durable chalkboard surface on the market. You do not have to worry about pieces of the chalkboard chipping off or cracks suddenly appearing in the middle of your new chalkboard. The easy to wipe 2 by 3-foot surface allows teachers to present multiple lessons, without them having to wipe the surface clean before each new lesson. You can save important science information in one corner of the Vinyl Chalkboard, while you perform arithmetic on the other side. The solid oak wood trim stabilizes the chalkboard surface and it adds style to your classroom decor.